Palak Paratha or Spinach Paratha is very healthy and tasty recipe for kids who hate eating leafy vegetables. Add grated cheese as stuffing and make stuffed Parathas and kids will love it. This Indian Flatbread it made from Whole Wheat flour and is a perfect breakfast dish. Check step by step guide on how to make Stuffed Palak Paratha at home. Add all the ingredients in a large bowl – Whole wheat Flour, Ginger Garlic & Green Chilli Paste, Coriander & Cumin Powder and Salt. Now add chopped spinach, chopped fresh coriander and 1 tbsp. Oil. Add water as required and prepare the stiff dough. Add some oil and knead again. Make medium size balls from the dough. Sprinkle some dry flour and roll the Parathas. Fold it in half to form a semi-circle and again fold it to make a triangle. Apply some dry flour and roll triangle shaped paratha. Place the paratha over Tawa on medium heat. Cook the Palak Parathas with some Oil. Gently press and cook till they are crisp and brown on both sides. To make cheese stuffed paratha, add grated cheese in centre of rolled paratha. Fold the paratha from 4 sides and cover the cheese (check the video below). Sprinkle some dry flour and roll square shape paratha. Cook the paratha in the same way as described above. 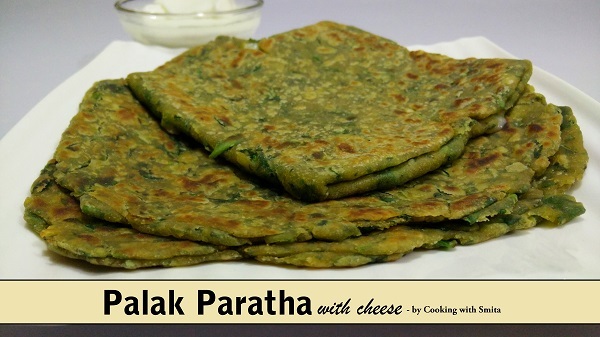 Serve Palak Paratha hot with Curd, Chutney or pickle.